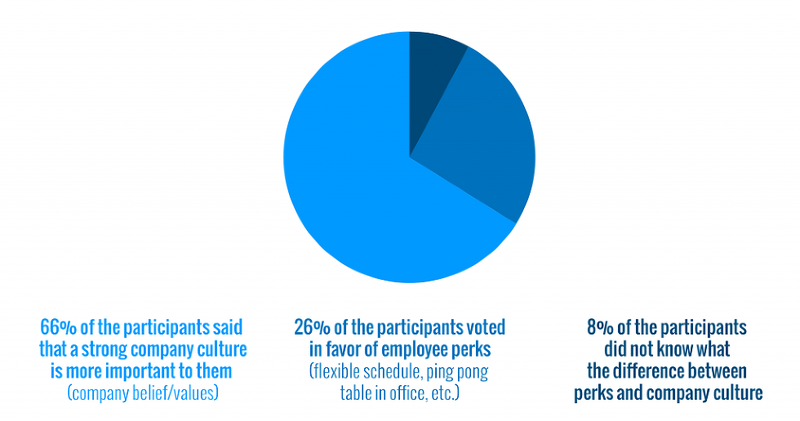 8% of the participants did not know the difference between employee perks and company culture. The results above demonstrate how important it is for a company to focus on building their culture by expressing their beliefs and values. Millennials are more focused on working for a company they can relate too, somewhere that shares the same passion they do, professionally. “Showing off your cool new office and smoothie bar are no longer the best way to attract top talent,” said CAREEREALISM founder and CEO, J.T. O’Donnell “Today’s sophisticated job seeker knows a ‘snow job’ when they see one. Yes, the perks might get them to look at your company, but their next move is to, “get under the hood and kick the tires” before they decide to apply.” According to O’Donnell, job seekers will search for information about a company online. Professionals want to read stories and watch videos about a company they are interested in to help them understand what it is like to work with them. If a job seeker likes what they see when researching the company, that will motivate them to submit their application. If your company is interested in learning how to make your company culture awesome or is seeking resources on the topic, please download this free ebook. To request additional information, please contact employmentbranding@workitdaily.com.